A recent report published by Infinium Global Research on V2X market provides in-depth analysis of segments and sub-segments in global as well as regional V2X market. The study also highlights the impact of drivers, restraints, and macro indicators on the global and regional V2X market over the short term as well as long term. The report is a comprehensive presentation of trends, forecast and dollar values of global V2X market. According to the report, the global V2X market is projected to grow at a CAGR of 17.5% over the forecast period of 2018-2024. Transportation is the fundamental factor that contributes to the economic growth and quality of life. Vehicle-to-X refers to an intelligent transport system where all vehicles and infrastructure systems are interconnected with each other. This connectivity helps to optimize traffic flows, Minimize emissions, Reduce traffic congestion and Cut accident numbers. The V2X is based on Dedicated Short Range Communications (DSRC) or the cellular connectivity that uses wireless technology that enables data exchange between a vehicle and its surroundings. The V2X technology allows the vehicle to communicate with moving parts of the traffic system around the vehicle. The V2X technology offers several types of communications including V2I (Vehicle-to-Infrastructure), V2N (Vehicle-to-network), V2V (Vehicle-to-vehicle), V2P (Vehicle-to-Pedestrian), V2D (Vehicle-to-device) and V2G (Vehicle-to-grid). The V2X technology uses 5.9 GHz dedicated short-range communications band with the Wi-Fi. The Wi-Fi connectivity is the important part of the V2X technology as they enable the establishment of a reliable radio link, even in non-line-of-sight conditions. The V2X shared information to the driver about surrounding vehicles speed and infrastructure will further help the driver to avoid the collision. The traffic road intersections are getting more complex nowadays. It generates high demand for the more intelligent control solutions that help to minimize the traffic problems in an efficient way. The growing demand for more efficient and real-time traffic management system drives the growth of the V2X market. The V2X technology enhances traffic efficiency and smarter transportation management by providing upcoming traffic congestions and suggesting alternative routes. In addition, the various government agencies are taking initiatives to adopt V2X technology to provide safety and better traffic management. 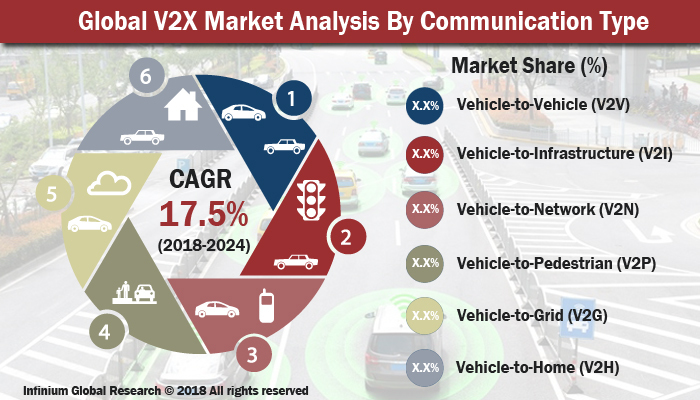 In addition, the growing use of electronics system in the vehicles to improve the vehicle performance and passenger comfort are likely to contribute to the growth of the V2X market. Another use for V2X is to help you find parking in crowded areas by using the vehicle’s cellular connectivity and can display the locations of nearby available parking spaces on their navigation systems in real time. However, data security concerns and the cellular connectivity problems across the developing region are hampering the growth of the V2X market. Moreover, the growing adoption of autonomous cars and ongoing research and developments in the automotive sector are projected to create various opportunities for the companies working in this technology over the forecast period. The growing applications of V2X in the rail, ship and airplane transportation are projected to create various growth opportunities in the near future. Among the geographies, North America is the largest region in the V2X market followed by Europe. The growing demand for efficient and improved traffic transportation system. The factors such as better infrastructure, easy adoption of new technologies and favorable government policies contribute to the growth of V2X technology market in North America. In addition, Europe is the second largest region in the V2X market. The increased concern about the safety and the growing need for traffic management in Europe drivers the growth of the V2X market in this region. Moreover, Asia Pacific is the fastest growing region in the V2X market owing to the rapidly growing automotive industry, the presence of various top players and increasing adoption of new technologies. The report on global V2X market covers segments such as component, communication type, connectivity type, vehicle type, and propulsion type. On the basis of a component, the global V2X market is categorized into hardware and software. On the basis of communication type, the global V2X market is categorized into vehicle-to-vehicle (V2V) communication, vehicle-to-network (V2N) communication, vehicle-to-grid (V2G) communication, vehicle-to-infrastructure (V2I) communication, vehicle-to-home communication (V2H), and vehicle-to-pedestrian (V2P) communication. On the basis of the connectivity type, the global V2X market is categorized into DSRC, and cellular connectivity. On the basis of vehicle type, the global V2X market is categorized into commercial vehicles and passenger cars. On the basis of the propulsion type, the global V2X market is categorized into ICES and EV. The report provides regional analysis covering geographies such as North America, Europe, Asia-Pacific, and Rest of the World. In this section, the key trends and market size for each geography are provided over the period of 2016-2024. The countries covered in the North America region include the U.S., Canada, and Mexico; while the Asia-Pacific region includes countries such as China, Japan, India, South Korea, Malaysia, and among others. Moreover, Germany, U.K., France, Spain, and Rest of Europe are the major markets included in the European region. The U.S. drives the growth in the North America region, as it is the largest market in the region. In the Asia-pacific region, rapid industrial growth in India and China offer a substantial potential for the growth in the V2X market. As a result, the APAC region is projected to experience a growth at a CAGR of x.x% over the forecast period 2018-2024. The report provides profiles of the companies in the global V2X market such as Continental AG, NXP Semiconductors, Qualcomm Technologies, Inc., Robert Bosch GmbH, AUDI AG, Delphi Automotive, Infineon Technologies AG, Cisco Systems, Inc., Autotalks Ltd, and HARMAN International. The report provides deep insights into the demand forecasts, market trends, and micro and macro indicators. In addition, this report provides insights into the factors that are driving and restraining the global V2X market. Moreover, The IGR-Growth Matrix analysis given in the report brings an insight into the investment areas that existing or new market players can consider. The report provides insights into the market using analytical tools such as Porter's five forces analysis and DRO analysis of V2X market. Moreover, the study highlights current market trends and provides forecast from 2018-2024. We also have highlighted future trends in the V2X market that will affect the demand during the forecast period. Moreover, the competitive analysis given in each regional market brings an insight into the market share of the leading players. This report will help manufacturers, suppliers, and distributors of the V2X market to understand the present and future trends in this market and formulate their strategies accordingly.